Toys and gifts have fast become a very vast field which has equal shares in the niche of physical commerce as well as e-commerce. In a fast developing market, the impact is all that matters. Kids do not get attracted to a toy unless the packaging fails to attract them. Custom toy boxes have become an inevitable need considering the immature nature of the target customers: kids. Toy companies, thus demand the customized toy boxes which are too attractive to be ignored by the kids. As it has been with all other niches, had packaging managed to attract the customer, the product would also have good chances of getting sold. Why Get Custom Toy Boxes? 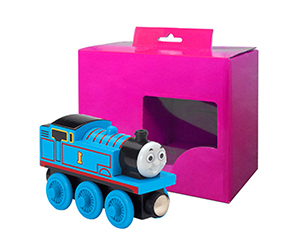 Premade toy boxes can also do the job; they come in all different sizes and shapes, but there is a reason why every other toy company opts to have custom made toy boxes. The reason for this executive decision lies in the differences pertaining to the type of toys, marketing approaches, and branding styles. Every company has its own way of reaching out to the target customers and marketing the products. It is actually because of the different approaches, why different companies have different types of packaging. Your company has its own business philosophy and this is why you need your own custom toy boxes to reach out to your target customers in a very prominent, unique and impressive way. What is in a Personalized Toy Box? Material – All custom boxes are not made in one material. There are two to three or more materials to consider. For example, a custom toy box can be made of Kraft, corrugated fiberboard, Bux board or any other cardboard material. Colors – When you decide to buy custom-made packaging, you choose from readily available color models. All companies offer two or more models for the customer’s convenience. For example, CMYK and Pantone are the choices. Shape & Structure – Customized toy boxes are made in many structures such as straight tuck, reverse tuck and auto-bottom and die-cut window pane. Design & Finish – As far as design and finish are concerned, there are many variations. You can choose from gloss or matte finish, gold or silver foil and then there are embossing, debossing and raised ink etc. 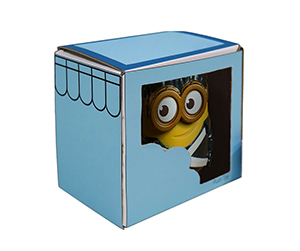 Why Get Customized Toy Boxes from PackagingBlue.Com? Affordable Pricing – We offer the most affordable rates around in the packaging industry. Free Shipping – We only charge for the boxes and we do not charge at all for shipping. Professional Offset Printing – The boxes that we provide go through a very lengthy and careful offset printing process. Fast Turnaround Time – We are known for delivering our orders within only 3 to 4 business days. Customer & Sales Support – Our customer support team and sales team are available 24/7 to help our respectable customers. Ecofriendly Packaging – PackagingBlue.Com abides by green initiative and this is why we do not use any materials which are hazardous to kids or animals.